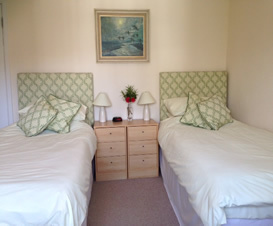 Lynwood House has twin and double rooms available. 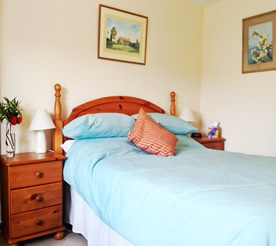 Three rooms are situated in the main house and all have en-suite with shower, basin and loo. In addition to these there is a luxury self contained Studio, which can be let for B&B too. 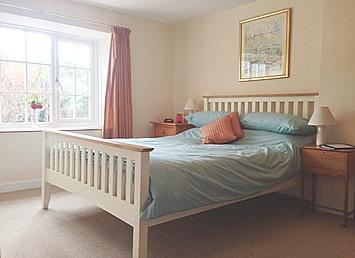 Bedrooms either overlook Tregony valley or the south facing garden; they are modestly decorated with country cottons and comfortably furnished. Each room has Wifi, a HD ready television with Freeview, hairdryer, radio alarm clock, a wide selection of teas and coffees, and a mini fridge for fresh milk. A delicious breakfast will be served on the long dining room table (Abigail is a Leith’s trained chef). You will be offered a continental breakfast Monday to Friday (term time) at 8am, and a full English cooked breakfast everyday at 9.15am. Vegetarians will be happily catered for if Abigail is advised on booking. B&B Guests who are booked into the Studio have the additonal option of having a continental breakfast laid out in their room, to have at their leisure. Lynwood House is not licensed, however the local pub and off-license are just up the road so your stay need not be teetotal. For evening meals there are some excellent pubs locally, one in walking distance and others only a few minutes drive away. The local fish and chip van parks up in the square on a Wednesday and Friday night. You are most welcome to enjoy the garden during the day and sit on the sunny terrace for tea or coffee. Please arrive between 4pm and 9pm, if an arrival time can be given it would be appreciated and please vacate your room before 10.30amon the day of departure. If you know you are not going to manage these times please do let Abigail know and she will try to make arrangements to suit you. The usual No Smoking regulations apply. However you are very welcome to smoke in the garden.